Author: Maarten Kossmann. Series edited by: Wilhelm J.G. Möhlig, Bernd Heine. Berber languages and dialects are spoken in an area stretching from Egypt, Libya, Algeria to Morocco and from the Mediterranean coast to south of the Sahara. The area includes numerous large Arabic-speaking regions, yet speakers of the various Berber languages make up approximately 50% of the population in Morocco as well as about 25% in Algeria. Along with the Semitic, Egyptian, Cushitic, and Chadic languages, the Berber languages form one of the main branches of the Afro-Asiatic (formerly known as Hamito-Semitic) language family, the principal language family found in northern Africa and the Middle East. The Berber languages vary to a degree comparable with the various Germanic languages. However, the Afro-Asiatic languages differ from one another much more than, for example, the Indo-European languages. Thus there is only a limited possiblility of applying methods known from Indo-European linguistics to the task of reconstructing the respective Afro-Asiatic proto-languages. The term Proto-Berber refers to that stage of the language reconstructed from the present Berber languages, before it developed from mere regional varieties into the different Berber languages and dialects. The author’s reconstruction of the phonological system of Proto-Berber is based on a wide spectrum of regional and local varieties of the different contemporary Berber languages. This contrasts with earlier attempts mostly limited to Tuareg, which has traditionally been regarded as an especially archaic variety. 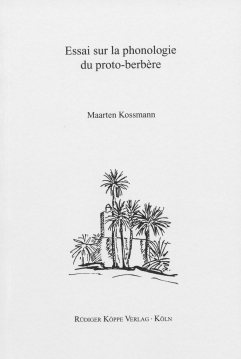 The author details the problems concerning the short vowels, the consonant h, the velars, and the marginal consonants and compiles his results in a phoneme inventory of Proto-Berber consonants and vowels that may serve as a starting point for the reconstruction of both the lexical and grammatical elements of Proto-Berber.